Thousands of protesters have staged a series of pro-reform demonstrations across Egypt in defiance of the government’s warning. Protesters demonstrated in Cairo, Alexandria and at a Nile Delta university on Wednesday, but large numbers of police officers stopped the participants from reaching the parliament, their main target. 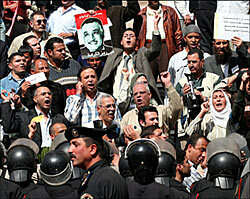 … A similar demonstration in Alexandria was called off after security forces sealed off all routes to the site. 20 people were detained in Alexandria and another two were held at a rally in the Nile Delta town of Mansoura. There were no arrests reported in Cairo. Marchers in Mansoura claimed to have been set upon by pro-Mubarak thugs, although this has not been confirmed by police. “They (the authorities) are threatened … They think the situation is escalating,” said a Cairo member of Kefaya, who asked not to be named. This explains why Egypt officials cracked down on the largest opposition party over the weekend. I am sure that Big Pharoah will have an update later. Blogger Kafie at Enough! has more pictures from the protest.